Jackie Dumaine is a former corporate executive who left her six-figure career in advertising to study yoga in India. She traveled to Rishikesh in the foothills of the Himalayas, where she enrolled in a yoga teacher training course at Anand Prakash Ashram. During the program, she connected deeply with the philosophical side of yoga. The principles for living outlined by the sage Patanjali in the Yoga Sutras (yamas and niyamas) struck her as a blueprint for creating a balanced, peaceful, and joyful life. When she returned home to Calgary six weeks later, she launched her first company and quickly partnered with Deepak Chopra and Wayne Dyer. Then one day while running on her favorite trail, Jackie was struck with a vision for The Yoga Code – a complete system for sharing ancient yoga wisdom with a fresh and modern twist in order to help people create more beautiful and inspired lives. Today, Jackie is a sought after retreat leader, speaker, and coach. In this interview, Yogi Times editor Misha Bell speaks with Jackie about her path from distressed corporate executive to spiritual entrepreneur, and her global vision for The Yoga Code. Misha Bell: What motivated you to quit a lucrative job in advertising and travel to India? Jackie Dumaine: I was in a fairly dark place in my life at the time, and it felt like I didn't really have a choice anymore. My soul was so exhausted and depleted that I needed to do something. Anything. Yoga was a grounding rock for me at that pivotal time, providing me with the strength and courage to make changes in my life. Traveling to India to study yoga felt like the perfect way for me to honor the tradition that was helping me to reconnect with my spirit while also honoring my desire to explore the world and experience new cultures. The thought of being able to share the healing power of yoga with others inspired me to make the leap and diluted my fears about leaving the false security of the corporate world. Misha: At what point did you know that you needed to leave your job? Did the awareness come in a flash or did it build gradually? Jackie Dumaine: I'm sure it was building gradually, but I wasn’t aware of it happening. It seemed to hit me in a flash when everything aligned for the "perfect storm.” It wasn't just my career that was depleting me, but my personal life as well. Life likes to throw it all in your face at once sometimes. In that moment, I felt an intense desire to run away from it all and start something new. It was time for my rebirth. Misha: How did you feel once you finally made the decision? Jackie Dumaine: I felt incredibly liberated. Once I committed to the yoga teacher training and placed my deposit, I was no longer in a place of limbo. I went a little crazy for a while debating on whether I should leave the security of my career for the unknown, however the moment I made a firm decision, I felt relief. There is immense freedom in commitment. Misha: How did you decide where you would go in India, and with whom you would study? 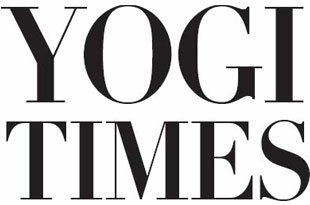 Jackie Dumaine: I was at a local yoga studio one evening relieving some of my work stress when I noticed a pamphlet for a yoga teacher training being offered in India. The moment I saw Vishva-ji’s smiling face on the cover I knew he would be my teacher. Known as the "Laughing Yogi,” his smile was infectious and my heart knew this would be an experience that would forever change me. And so it was. Misha: Vishva-ji also offers yoga teacher training programs in nearby Toronto. Why did you decide to study with him at his ashram in India? Jackie Dumaine: I have a tendency at times to display an "all or nothing/go big or go home" attitude. This has shifted immensely over the last few years, but at the time there didn't seem to be another option for me. If I was going to create a major shift in my life, I wanted it to be memorable and meaningful. Traveling to India appealed to my free spirit and fueled my passion for travel and adventure. Being able to study in Rishikesh – the yoga capital of the world, was a blessing. Misha: India has a special propensity for flipping one’s life upside down. What was your experience of India? Jackie Dumaine: Such a wonderful question. My initial experience upon landing in India was drenched in chaos. It began with a lack of confidence in knowing if our "taxi" driver understood where our hotel was, which was exacerbated by his decision to drive on the wrong side of the highway. Between the blinding glare of oncoming traffic, the incessant honking of horns, and the pungent unfamiliar odor that consumed every inhale, I began to question everything in my life. My body began to freeze with fear. I wanted to go home. This desire to hop on the next plane back to Canada was short lived, however. My curious nature began to see these experiences as an adventure and from then on, I absorbed each one with a smile. On the drive from Delhi to Rishikesh, the grey and dusty landscape was peppered with hope by the women dressed in their brilliant colored saris. The children would run up to our comfortable coach bus, waving and smiling to the newest group of Westerners to visit their land. Passing village after village, I couldn't help but notice every detail. I could go on and on about my experience of India. In regards to flipping my life upside down, I believe this came after the trip and upon my arrival back home. The integration process back into Western civilization was difficult. Very difficult. Almost surreal. My attitude was somewhat self-righteous in that I no longer wanted to participate in mundane conversations about irrelevant events. The excess consumerism I witnessed made me feel ill."What's wrong with you people?" was a constant question in my head. I wanted to go back to India. This again was short lived. As I acclimatized to my Western surroundings, I softened my approach. Although life has never quite been the same since India (I don't think it ever is for most who travel there), I am grateful for what India taught me. Misha: What are the greatest discoveries that you made in India? Jackie Dumaine: Simplicity – and all that comes with it. The ability to just "be" in life. To smile and find joy in having few possessions. To allow life to flow without needing to force or control it. To "unplug" and be present with family, friends, and community. That food doesn't need to be complicated or in large portions to be satisfying. That the act of devotion carries a powerful sense of hope. That prayer brings freedom from worries and fears. That beauty can be found anywhere. In everything. In everyone. Misha: What about India lives most strongly in your soul today? How does this play out in your life? Jackie Dumaine: I would say my most vivid memory from a internal perspective was how it felt to have everything I needed, even with so little. I arrived with a duffle bag of clothes and toiletries, and it was all that I needed. I lived in a small room with a marbled floor, ate simply, meditated, and practiced yoga. Initially, I was able to maintain this simplicity when I arrived back in Canada. However, four years later, my life is nowhere near as simple as it was in India. I am aware that I play the lead role in complicating it. As I write this, I'm sitting in my yoga room noticing the pretty and coordinated bolsters and yoga mats. The wall next to me is adorned with gold and cream mandala-inspired wallpaper from Europe. A variety of aromatherapy room sprays sit on the shelf. The closet in front of me is full of clothes that I have yet to unpack from my not-so-recent move. I'm sitting comfortably on a mango wood meditation chair and the side table next to me is littered with crystals, mala beads, a lemongrass soy candle, and a cup of my favorite tea. And to think that in India, all I needed in order to practice yoga and meditate was, me. I suppose it's time for a reevaluation of what simplicity means to me. As always, the Universe never ceases to provide us with opportunities to grow. Misha: Tell us about The Yoga Code. What is it? When did you first get the idea? Jackie Dumaine: While taking yoga teacher training in India, I became intrigued by the immense depth of yoga philosophy and surprised at how little asana played a part in the history of yoga. The sage Patanjali taught that ten principles for right living were to be mastered before practicing asana. Known as the yamas and niyamas, these principles are a blueprint for ending the drama in our lives and creating more joy. They act as a "code" for living a life with more purpose and meaning. These principles are: compassion, truth, non-stealing, moderation, non-attachment, purity, contentment, commitment, self-inquiry, and surrender. I became fascinated with this uncomplicated wisdom and I knew I wanted to share it in a deeper way. I created The Yoga Code in an effort to teach others how this ancient wisdom could be applied in all areas of our modern world: relationships, parenting, business – even finances. I share this through workshops, retreats, and a unique coaching system that integrates the ten principles into a transformational three month program. I'm currently working on The Yoga Code book, and soon after it is released I will be developing a coaching certification program to train others to coach or facilitate their own workshops using The Yoga Code Coaching system. I feel so grateful to have discovered this wisdom. To able to share it as my life's work is an honor. Misha: What challenges have you faced in taking The Yoga Code from vision to reality? Jackie Dumaine: I feel so incredibly fortunate that the vision for The Yoga Code has been able to grow organically and with relative ease. The Yoga Code has been embraced with open arms by those in the yoga community, which I didn’t necessarily expect. I take this ease as a sign that I'm on the right path and that The Yoga Code message is one that needs to be shared. My greatest challenge has honestly been my own resistance. My vision for The Yoga Code is wide and bold, and there are times that fear creeps in. Misha: How do you tackle your fear? Jackie Dumaine: By taking action. I have found that action relieves anxiety. One day I wrote a blog post declaring my bold vision for The Yoga Code. After several years of incessantly talking to those in my inner circle about what I wanted to accomplish, it was time to speak publicly. I discussed my plans for a book, an audio meditation program, and a coaching certification program, laying it all out for everyone to see. This left me feeling quite naked, but at the same time very free. It's quite amazing what occurs when we confidently share our dreams out loud. The Universe immediately begins assisting us. I found the people, resources, and courage to move forward with my vision all appear, like magic. Misha: If you could have one guaranteed outcome of The Yoga Code, what would it be? Jackie Dumaine: This is a great question. What I’m finding is that by weaving these principles into our daily actions and thoughts, we begin to move into a state of expansion that allows us to flow with life rather than continuously fighting it. This is an incredibly powerful outcome, and leads to an increased ability to manifest, a deeper connection with and understanding of the Self, and the courage to begin making dreams a reality. Ultimately, my hope is that one day people from around the world will have a deeper understanding of the true essence of yoga and that The Yoga Code will have inspired and positively impacted millions in every corner of the globe. Misha: Thank you, Jackie! We wish you the best of luck with The Yoga Code. For more information on Jackie Dumaine and The Yoga Code, visit jackiedumaine.com.